Throughout history, purple has been widely documented as a color of privilege often associated with royalty. During medieval times, dyes that produced the perfect shade of purple were so costly that only kings and queens could afford them, hence the term “royal purple.” While many would not consider it for a wedding, this bold and mysterious color is actually brimming with creative possibilities for decorating a shower, tea party, or reception. Typified as regal and sophisticated, it can turn charming and pretty when matched with the right palette of colors. Table settings, centerpieces, and favors–all can take on an unexpected appeal with the tasteful use of purple. The basic color palette for light purple would include shades of pink and green. Purple comes in a wide spectrum of shades, making it ideal for a sophisticated look. A basic color palette for light purple would include pinks and greens. Thus, shades like lilac, thistle, or periwinkle may be paired with white, baby pink, lime green, powder blue, and even silver or gold. Deep purple would work best with chocolate brown, pink, and green, as well as a touch of royal or cornflower blue. Another elegant use of purple is in a monochromatic color scheme such as lilac, lavender, and amethyst. Attractive accents for these would be brown, silver, or cream. Applying any of these palettes to the party table settings would definitely make a statement. 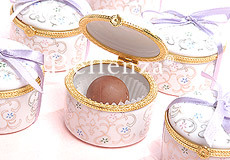 Porcelain boxes with dainty floral designs and lilac ribbons are set against a pale lilac tablecloth. A table setting with a light and airy purple palette uses a pale lilac tablecloth with subtle damask patterns as its canvas. Glistening silver flatware and delicate fine china receive a charming touch with purple pansies resting on crisp white table napkins. For guest favors, porcelain boxes with floral accents and a pretty lilac ribbon rest beside each place setting. For a table setting with a darker color palette, violet, dark pink, and silver make for a rich display, while a combination of purple, blue-violet, and slate blue creates a dark and exotic feel. Apply these to the table linens and decor accents for the desired effect. Dainty floral sachets in lilac or lavender pouches may be displayed as part of each place setting for the guests to take home afterwards. Purple is a flexible color that can be matched with bright shades of pink, blue, and chartreuse. You can also coordinate it in a brilliant palette of gold! See some inspirational ideas for a purple and gold wedding! Whether floral or edible, a purple-based centerpiece would be most attractive with the use of elements that have this color in varying degrees. For an edible centerpiece with an interactive purpose, tiered trays may be filled with a delectable mix of cupcakes with lavender and pink frosting, purple foil-wrapped chocolates, and lilac-colored almond dragées. 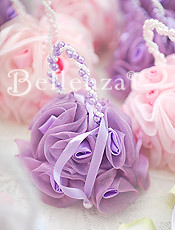 Pomander-shaped sachets can come in the loveliest shades of purple and can be matched with pink for contrast. 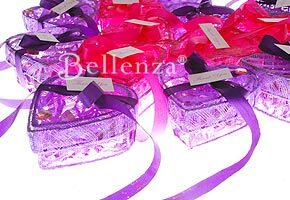 Whatever the occasion’s theme, purple may set the tone–both in the favors themselves and in the packaging. 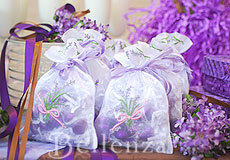 Whimsical pomander-shaped bags can be filled with delicate lavender oils, potpourri, or scented glass beads. Jordan almonds in a pretty purple shade may fill a silk pouch. Grape-flavored crystallized candy may be presented in purple boxes, and then arranged as an attractive table centerpiece. Though purple comes across as a strong color, it actually offers such a wide range of shades to work with. From the deepest violet to the most delicate lilac, it can establish the desired look for the occasion through tastefully-crafted table settings, centerpieces, and guest favors. Indeed, purple need no longer be the most dreaded wedding color. – Purple Wedding Reception Ideas – A slide show from Brides.com. – Purple and Blue Wedding Bouquets – A slide show from BHG.com. 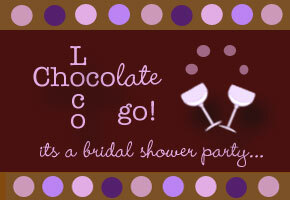 – Purple Party Themes – A list of party planning ideas from Confetti.co.uk. I’m actually having an aubergine and chartreuse color palette. I know a lot of people call purple the barney color, but I love it! Would chocolate and royal purple mix? II love these two colors but should i add another color? Would lime green and a dark purple, almost like a grape purple, be good to use? Yes, lime green can be matched with dark purple. If you are looking at a shade close to a grape purple, just be sure that it isn’t too dark because very dark shades may turn out blackish in the photos! By the way, moss green or even chartreuse goes very nice with dark purple. My husband wants to wear a gray suit and I want my maids to wear lavenda and purple how can I make the colours look great? so I am getting married Aug 7th and going with Expresso Brown and Fushia and I want to accent Lavendar?? Any advice. Mainly in flowers and decorating. That’s a beautiful color combination! Consider a pretty bouquet of tulips, toad lilies, or lilacs. These flowers not only make a striking statement, but you can incorporate soft pink blooms. If you want to apply them to your train, you may want some deep purple embroidery sewn onto the train by your seamstress. Find a pattern that will suit your style. Just be sure not to go overboard because it may end up looking a bit off. Instead of having it on your train, though you may want to just incorporate purple into the decor of your aisle runner. Think of an elegant lavender bouquet as the design! I love purple please tell me it’ll go well with blue (tiffany blue for example?) or perhaps baby blue? Yes, it is somewhat of a rich color combination. It looks to me that purple, brown, and yellow cream or almost vanilla is a nice color combo but indeed a rich one. However, if you want to temper or “soften” the look, I suggest you try adding a shade of pastel lilac, so that the purple becomes more of an accent color rather than a dominant color. You may also want to try a color combo consisting of pastel lilac, chartreuse, and yellow cream, while taking out brown so it would be more in tune to the timing of your wedding. However, this is all a matter of personal taste. i love purple and lilac for my wedding.pls i just wanted to ask if a touch of gold will be nice. Certainly! Gold adds a glamorous touch to the color palette. Or you can even use silver for a super chic look. Either way, the look is lovely. Kati-try matching chartreuse or a moss green color with that deep/bright purple hue! That would break the monotony of using brown. Me and my boyfriend have been talking about getting married when his sister gets back from across seas. We have decided on blue and purple for colors but I am not sure exactly what shades to go with. Any ideas???? Consider aqua and purple with silver. It’s an unusual yet elegant color combo with a chic look. You can also add touches of green to bring out the palette. For this color combo, you can either have a bold or pastel set to use. It all depends on your preference. I love purple but I also want a fall wedding. My fiance does NOT want orange at all just in case we accidentally look like clemson fans. What other colors could I use to incorporate purple into a fall theme (without looking dull). You may want to try plum purple and teal – the look is similar to a peacock green palette and you can add accents of gold to make it look glamorous. Your bridesmaids can wear plum or teal satin dresses. Then consider a bouquet of succulents or purple callas or lillies. A lovely buttercream ivory cake embellished with sugar flowers shaped like callas would also look smashing! would it be nice to combine Caribbean green and baby pink for the decoration for my wedding? Yes, Promise! It would look quite lovely indeed! What comes to mind is the colors inspired by the ever stylish fashion designer, Lilly Pulitzer. Check out this wonderful tablescape and party from Miss Janice. The look can be made for a Caribbean wedding with blooms such as cymbidium orchids, green carnations, and pink gerberas! Hello! I’m getting married next may and my favorite color is Purple (Royal Purple) and my fiance loves Blue . I don’t know what shades to pair with what? Is there a way that we can make those colors work for a May wedding that will take place in the evening? Which flowers would you recommend with this color scheme? Thanks. You may want to try a lilac, skiy blue, and silver color combo. Such a palette would still be fine for an evening May wedding. It would be elegant in a pastel or soft hue palette because these colors exude a cool tone perfect for a wedding. You can then add a royal purple to the palette as well. Try flowers such as blue irises, geraniums, or hydrangeas which work well with a blue and purple color scheme. My wedding is this fall. My dress is ivory. I want to use deep purple and ivory, with silver as an accent colour. Oh and the ceremony is outdoors on a lake. I am afraid that I am working against the obvious colours of the venue and as a result, it won’t look nice. Should I incorporate another colour…maybe red…to fuse the colours with fall??? Hi, I was thinking of these colors for when I get married? Chocolate brown, dark purple , baby blue and having some toucher of cream and silver. Is it a good combination or is it to much? I love purple and my bf loves blue, my best friend wont be in the wedding unless she wears a brown dress. How can I tie all these together whitout looking like a clown? Would these colors bee good for an afternoon going onto the evening wedding? Hi, Michelle — A fall wedding by a lake should be wonderful! Rather than adding red to your deep purple and ivory palette, though, why not try touches of muted sage green? Then, maybe gold highlights instead of the silver? These 4 colors together will give the feel of autumn, perfectly complementing the natural beauty around you at your lakeside wedding venue! 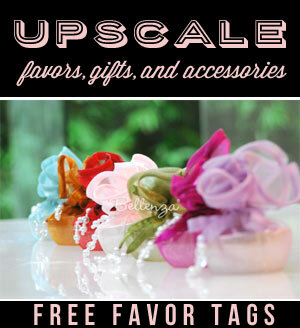 Hi, Marie — These links from the blog The Perfect Palette should give you some ideas for how to tie in all the color preferences you mentioned! pls can i make use of purple and baby pink for my wedding is it okay or what do you think? im getting married and i love Lilac, purple and sweet pink( light pink) will this be fine or is too much? Hello, Owoseni — Purple and baby pink are definitely a pretty combination! But since purple is quite a strong color, try to use it sparingly…maybe in the bridesmaids dresses, a bridal sash for your gown, and perhaps the table napkins at the reception. The pink can be brought in through the bouquets and the table centerpieces. Hello, Zelda — Adding lilac to a purple and sweet pink palette would be very nice! You could have all 3 colors in a gorgeous bouquet for yourself…then the bridesmaids in lilac dresses with alternating purple and pink nosegays or wrist corsages. Hi, Krystal! I hope I understood your question right–and can help you from going crazy! This is what we would suggest (pretty close actually to what you described). 2. Your groomsmen (GM) can be in chocolate brown suits with neutral-colored vests (perhaps ivory), then the purple and green can be brought in through their boutonnieres. 3. Reception – the color scheme you described for the tables (white cloths with brown runners & chair sashes, and purple-and-green centerpieces) sounds just fine! If your venue can provide ivory table cloths, though, instead of pure white, that would be even nicer. With such strong colors as purple and chocolate brown, it’s better to just add touches here and there of the other colors you want. All the best for your upcoming wedding! do you think a plum, purple and silver combo would be ok for fall? does it look old-fashioned? and any flowers to use for the tables? Hi, Anastasia — Plum, purple and silver need not look old-fashioned if you choose decorative pieces with a contemporary look. In the reception table decor, for instance, you can apply the purple and plum in the floral centerpieces, table napkins, and table numbers, for example. Then, you can bring in the silver via stylized, modern-looking vases, napkin rings, holders for the place cards and menu card, candlesticks, etc. All the best in your wedding preparations! Hi, Bethany — Deep purple IS a lovely base color for a wedding palette. Regarding what kind of pink and green to combine with it, it depends on the mood you’re aiming for. If you want an elegant, rich look, deep fuchsia and sage green would be beautiful. But if you want something lighter and brighter due to the spring season, you might consider powder pink and mint green. Either way, you can find flowers in a range of pinks — like peonies, dahlias, carnations, lilies, and of course roses. Then to bring in the green, you could try succulents, dusty miller leaves, green cymbidium orchids, or green chrysanthemums. Our wedding is in June and I like the colors violet purple and pastachio green for my bridesmaids dresses. Is that a wise choice for a summer wedding? Hi, Danielle J — Certainly, for a summer wedding, those colors would really pop! I can just picture how pretty those dresses will look against neutrals in the rest of the wedding party–with you, of course, standing out in your ivory or ecru wedding dress. I am looking at doing Royal Blue, Purple and Champaign for our July wedding. It is outdoors in a garden and then the reception is indoors in a ballroom. The wedding party would have Royal Blue dresses and vests with black tuxes. Not sure how to incorporate the rest or if this color combination would work? Any ideas of how to incorporate the champaign and different flowers to use? Hi, Korey — Royal blue and purple (both strong colors) are likely to compete in your wedding palette. So I’d suggest that your dominant colors would be royal blue at the ceremony and champagne at the reception — with purple as only an accent color. For example, you could have the royal blue bridesmaids’ dresses with ivory-purple-champagne bouquets; then the gentlemen’s black tuxes with royal blue vests & ivory-purple-champagne boutonnieres. At the reception, the champagne could be more dominant (like in the table linens), with ivory and purple flower centerpieces. Hope this helps! Hello, Faith — The palette you have in mind isn’t that common. But it can be very pretty, if you choose just the right shades of purple and mint green. To give you a clearer idea (rather than me merely describing the shades), visit these links for some really lovely ideas! Hi Lissa, Thanks for your help. I really appreciate it. Hi! I am getting married on 2nd week of August 2012. I need help with my color scheme. I chose a sugar plum and enchanted yellow scheme. The location is up on a hill in a garden overlooking the ocean between 5-10pm. Need your advice if this is a good combination. I’m using sugar plum as my base color and yellow as accents. Thank you! Hi Juvy — Plum and yellow would be such a pretty motif for a garden wedding like yours! You could have the bridesmaids’ dresses in plum, with sweet pale yellow and ivory bouquets. And the gentlemen could have plum-colored ties, with pale yellow and ivory boutonnieres. Hi, kindly advise if these colors will do for a June 2012 wedding . am thinking of Using Purple, Royal Blue and peach, purple is my favorite color and royal blue my BF colors. Hi, I’m getting married august 2014 and I want to use deep purple, chocolate brown and silver. Can you please tell me if these colors can work together. Puple and brown are the main colors and I want to accent with the silver. Hi! Im Getting Married September 2013. Im thinking about having Plum, coral orange, and gold with accents of sage green. The girls would be wearing plum dresses. My fiance wants to wear grey with plum tie instead of black or white. Would the grey suits be too off from the color scheme? If so what other options would I have? These colors aren’t set in stone at this point! Thanks for your help!! Hi, Keosha — That’s quite a busy color palette you have in mind. But I can see how it could work if some of those colors are the dominant ones and the others are just highlights. It would be lovely if, as you say, your bridesmaids would be wearing plum dresses, then their bouquets could have pretty coral orange flowers with sage green leaves. The groom and groomsmen could be in grey suits with plum ties — since grey is a nice neutral color and complements most any palette. Then, perhaps their boutonnieres could have tiny coral flowers. 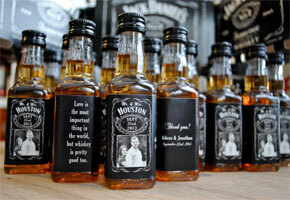 All the best for your 2013 wedding! Hi there!! BIG DAY will be on June 2013 ,a church ceremony. Our favorite color is deep/bright purple hue, white and chocolate brown.We choose white gown and ivory suit , deep/bright purple hue for BM, black vest top with white long shirt and bright purple tie for GM. Reception will be at the garden area.My BF wants light brown for the table setting.I dont know what shades to pair with. .Is it the outcome would be good?And which flower would you recommend with this color scheme?Really appreciated for your suggestions…Thnks and Godbless……. Hi Myrene — The colors you’ve chosen are already very bold and strong. So if your BF really likes light brown for the table settings, I would suggest a VERY pale brown (almost like coffee with lots of milk in it). This would make a nice neutral base for the place settings, which could have chocolate brown napkins with a bright purple flower tied to each one. 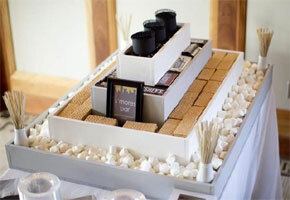 Then, the centerpieces could be purple orchids or hydrangeas or dahlias. Hi! am a little confuse about the colors I want for my big day next summer…I have three different theme but I don’t know which one to choice since I love both purple and peach. I was thinking of purple, silver and ivory, or peach, sky blue and gold, or teal, gold and ivory…I can’t seem to decide which theme to choice..PLEASE HELP! Hello, Jeri! Trying to picture the colors you’ve chosen and how you plan to use them, this sounds like it could be quite lovely. The different shades of purple (from plum to lavender) are very appealing together — from the aisle decorations to the centerpieces and even to the vest and tie of your BF. But yes, a white shirt would look too stark beside the plum. So try to find an ivory-colored one to match your dress. The only other suggestion we’d have is to limit the dark plum to maybe just your BF’s accessories and the ribbons of your aisle decorations. Since this will be a June wedding (you must mean 2014? ), lighter shades like lavender and lilac would be perfect for the season. Hope these ideas help! Wow! What a unique color for a December wedding! You can probably accentuate this color scheme with some touches of gold. I’d then select soft florals in pastel with flowers such as zinnias, dahlias, or roses. Another option is to omit orange and have a more green palette, which is very trendy nowadays.